We Happy Few‘s new name might have to be “We Happy Many,” as three new modes have arrived in its latest update. Survival, The Night Watch, and Sandbox modes are now available, in addition to the main campaign. The survival mode is essentially an arcade mode that will have your character hunting for food, water, and shelter as you try to defend yourself against the citizens of Wellington Wells. You will have to use stealth, crafting, and your skills, to score well in this timely challenge. However, there is also the option of simply escaping the island. It is based on the Early Access experience previously available on the Xbox One, before everything shifted to the current story-focused version of the game. The Night Watch, which was formally known as Wellie Mode, has you play as Bobby named Constable Constable. Your job is to keep the Downers out of the town all while not running out of the drug Joy, so you don’t become one of them. It has a horde mode feel to it, as each night you are watching becomes harder and harder. However, you will be able to upgrade your weapon to deal with these enemies, which become more difficult as time goes on. The Sandbox mode allows you to simply explore the world without any goals or story elements getting in the way. Cheats are allowed in this version of Wellington Wells, and you can create as much chaos as you’d like. You could just simply walk around the creepy, but creative world that Compulsion Games has made as well. Oh, joy! These latest additions to We Happy Few fulfill the last promises made during the Kickstarter campaign for the game. In addition, the remaining physical rewards are just about finished. 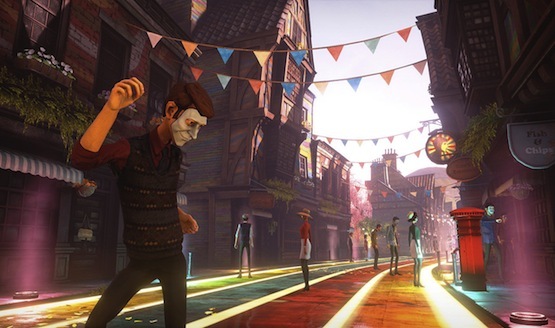 We Happy Few might be the last PlayStation-released title from Compulsion Games, as the developer was recently acquired by Microsoft. The studio’s previous release, Contrast, may have been the first game you played on the PS4. It was one of the first free PlayStation Plus titles for the system. Will you be playing We Happy Few again after this new update? Let us know!